"Most Earthmen were Medievalists in one way or another. It was an easy thing to be when it meant looking back to a time when Earth was the world and not just one of fifty. The misfit one of fifty at that." I have never read Asimov, which is surprising as I like sic fi. 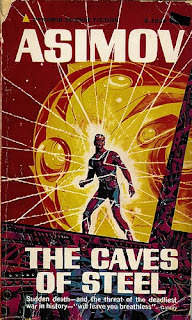 I love Isaac Asimov's works! I haven't read any books from the Robot series--I really should. I read this book, I really like this robot books. Oh - is Tabula Rasa named for classical music? Ahh, sci-fi! One of the few genres I have left to try! Excellent teaser, though. And thanks for stopping by my TT post! This is one author I've never read, but it sounds interesting. An interesting teaser, I don't think I've read Asimov, though I've definitely heard his name. Thanks for visiting my Harry Potter teaser! Brooke, The Golden Eagle, Heather - I haven't read Asimov either, just one book. But this series seems pretty great!! Silsbee - Thanks. It seems I'm having some problem with that box, trying to get it fixed!! Storytreasury - I am planning to read this series now and then the Foundation books!! No, the name is in the psychological context!! But most of us earthlings actually are medievalists in one way or the other. Actually, yeah, that's true too!